Full sun to mostly sunny. [24" tall x 24" wide]. USDA Hardiness Zones 4-10. 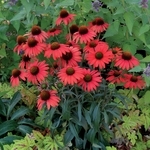 Echinacea 'Dixie Scarlet' PPAF. Flowers! Flowers! Flowers! This new beauty displays bouquets of velvety red flowers all summer long. The semi-recurved petals offer wonderful fragrance for humans and butterflies alike. Terra Nova calls this their best red to date.